Congratulations to Damien Lovegrove – winner of our October photo competition. Damien added Must-Chup Kick to his Ragu. 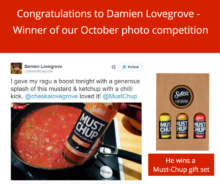 Here’s the winning photograph… Keep an eye out for future competitions and you could win a gift set or other lovely Must-Chup goodies…..